An affliction that is not too uncommon in the Modern City is the dearth of public restrooms. New York City in particular suffers from this affliction, despite its abundance of Starbucks and subway stations. Once upon a time, New York City’s subway system hosted over 1600 functioning toilets. Many of them no longer exist, and most of those left have long since either been closed off to the public or left in such horrible conditions that the Metropolitan Transportation Authority (MTA) denies inquiring commuters access to them. The most commonly cited reasons for their closure or denied access are “criminal activity” or that they are so dirty that they are a hazard to public safety; and the most common reason given for their contemptible condition is a lack of funding and time to maintain them. How is it that in New York City, by far the largest city in the United States and one of the wealthiest cities in the world, public restrooms ­cannot be maintained due to a lack of funding? And what can be done to improve the situation and lower the heart rates of our likely agitated fellow New Yorkers (previously myself included)? One solution––when the city finally updates to a Near Field Communication (NFC) payment card system––would be to let MTA riders use their cards to access public restrooms not only in subway stations, but in other public spaces as well. This NFC-enabled system could be integrated with the recently launched IDNYC municipal ID card and modeled after the public transit systems of cities such as Seattle or Istanbul, Turkey, which use NFC-enabled cards that charge varying rates depending on the user’s age, income, mode of transportation, and a variety of other factors. New York is long overdue for an upgrade to an NFC card system, and announced last year that it plans to have one installed by 2019. Now is the time to consider the desired scale of usability within the system, and learn from the successes and failures of other systems already in place. The three versions of Istanbul’s contactless municipal ID card, each with a different fare level. Integrating an NFC card system with IDNYC and allowing MTA riders to use them for access to public restrooms is a smart solution for maintaining safe and clean public restrooms in the interest of public health, because it not only builds upon a city-wide identification system that is already in place, but also allows a source of revenue to contribute to the costs of maintaining the restrooms. The city would not have to spend precious time and money deciding what design the new MTA cards should look like, nor would it have to set up a new and autonomous system to host and track riders. Users could be charged small amounts of money to use the restroom such as is done in many European cities; taking this a step further the users’ fee could be discounted for NYC residents, who would use their IDNYC cards, as opposed to tourists who would likely be using coins or disposable visitor’s cards. The list of possibilities for fee categorization and implementation is endless (but of course a straight-forward, hassle-free system is always preferred). To be sure, there would be a cost to installing locks and card readers at these public restrooms that can work with the NFC system, and there is the high possibility that these restrooms would be used by homeless people, but since when have either of those become acceptable reasons not to invest in public services and public health? Even if they were acceptable reasons, they still would not be valid reasons. But why? If done right, this system would not have to cost the city much at all over the years, and even if it did, the point of public services is ultimately to provide for the taxpayers—that’s what taxes are for. An entire book could be written on why it’s preposterous to worry about homeless people using the restrooms, but the most relevant reason is that they are humans and need restrooms; and in the absence of public toilets they relieve themselves in subway trains and on platforms, tracks, and in corners of the stations. This should be a huge concern for the city, as not only does this pose a serious public health hazard, but it also discourages ridership and contributes to overpacked trains containing vacated cars, which in turn impedes the productivity of the city. 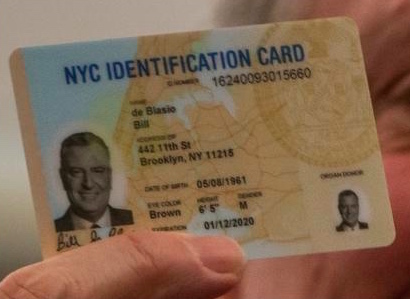 NYC Mayor Bill De Blasio’s IDNYC card. Ultimately the absence of public restrooms in New York City (and many other cities all over the world) is not attributable to high maintenance costs, but rather to a lack of support from the government bodies that decide their funding. At least we know that MTA plans on updating to a contactless system along the lines of NFC, and one can only hope that they will consider the benefits of building that system in conjunction with the IDNYC system, which would make controlling and maintaining public restrooms in the subway system—as well as other public spaces such as parks—much more feasible.